The Force Awakens opens exactly six months from today, which means that The Pop Culture Studio will be featuring a series of Star Wars-related posts between now and the film’s 17 December release date. 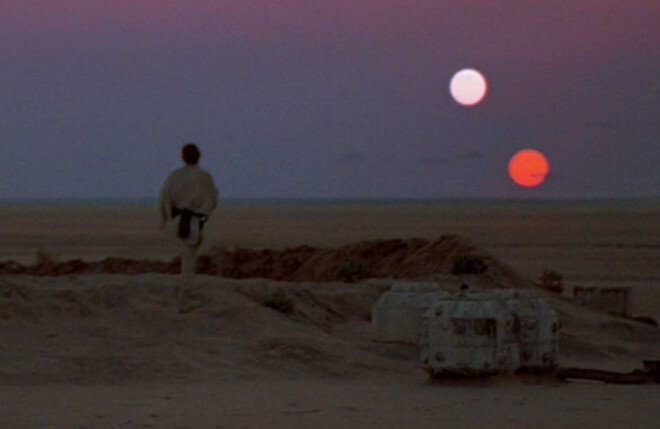 First up, we’ll be going back to where it all began with this Anatomy Lesson focussing on a scene from the original 1977 classic Star Wars Episode IV: A New Hope (or just plain Star Wars, to purists) – the binary sunset. This moment, when a young, eager for adventure Luke Skywalker watches as the twin suns of his alien homeworld set, is one of the most iconic scenes in the entire Star Wars saga, and therefore, in all of modern cinema. On the face of it, this scene might not seem like that big of a deal. I mean, it’s incredibly brief (it clocks in at under a minute), there’s no dialogue, and nothing really happens. Certainly, it’s easy to appreciate the visuals involved; Gilbert Taylor’s cinematography is gorgeous, and although some of the other effects work by ILM has dated, this faultless bit of pre-CGI trickery wouldn’t look out of place in a 2015 release. Even so, why is the binary sunset scene so important? Well, first up, it does a lot to establish the nature of the film’s story and its setting. I’m going to go on a bit of a tangent here, so bare with me. One of the key elements of the original Star Wars trilogy is that it took place in a “lived-in” environment; rather than the shiny, unrecognisably futuristic locales that viewers were used to from sci-fi films up until that point, thanks the production design of Ralph McQuarrie, Star Wars and its sequels take place somewhere recognisably similar to our own world, with dented vehicles, patched up clothes, scuffed floors and so on. Whilst the surface level qualities of this grungy aesthetic would be copied by countless imitators over the last 38 years, few really understood the heart of what Lucas and co. were doing, which was taking the cold, unrelatable trappings of the sci-fi genre and transforming them into something warm and totally identifiable to audiences. Despite taking place in a galaxy far, far away, Star Wars was a story featuring characters just like us, in a world that was somehow familiar to the one we knew. Bringing things back to the binary sunset scene, and it’s easy to see that this emphasis on audience accessibility is what this scene is all about – yeah, Luke’s wearing a weird kimono style outfit, and he’s gazing at the type of sunset usually witnessed only by drunksand those with severe cataracts, but who doesn’t immediately recognise the image of a wide eyed teen dreaming about the future as the day winds down, despite these alien trappings? That’s part of what makes this 36 seconds of screen time so important to Star Wars as a whole: it tells us to prepare ourselves less for a space opera but more for a coming of age story (or Bildungsroman, if you’re feeling in a literary mood), and allows us to look past the spaceships and lightsabers (the awesome, awesome lightsabers) to witness a story taking place in a world as real as our own. But for all that it establishes the narrative throughline of the story and the world it takes place in, the main value of the binary sunset scene really lies in how powerfully and economically it develops Luke’s character. At this point in the movie, we’ve had time to form a pretty reasonable opinion of young Skywalker: he’s clearly a good natured kid, but he’s also a bit on the whiney side. For the audience to invest in Luke as a lead protagonist going forward, we really need to feel where he’s coming from and understand WHY he’s prone to the odd bit of bitching (other than the obvious reason, which is that he’s a teenager! ), otherwise we’re not going to care about his heroic struggles when they come around later on. What the binary sunset scene does so efficiently and evocatively in its few fleeting frames is communicate to us the nature of Luke’s angst, which allows for us to become emotionally engaged with the character and his story as required. Before the scene starts, we already know that Luke is desperate to leave the farm and seek adventure, and when we see him stomping across the barren desert plains, it starts to become hard not to sympathise with the kid for getting a bit frustrated with his situation. And then, as the suns begin to slowly sink in the evening sky, and he gazes towards the horizon, his sense of longing for something more is palpable. Taking things further, he goes on to squint into the distance as if he can see his exciting new future just out of reach, and for the first time we get to see him not as a whiner but for the dreamer he really is. This makes us start to begrudge him less for his occasional juvenile outbursts, because we finally get him. But then, why shouldn’t we? Who hasn’t had at least one moment in their life when they yearned to find what it is they were meant to do with their life, and suffered from the crushing feeling that their present situation was never going to change? Luke’s character is now one that we can sympathise with, and obviously props are owed to Mark Hamill, whose performance captures the balance of hopefulness and anguish required for the scene, and to Star Wars creator George Lucas, who was behind the camera for this first installment in the series. Ultimately though, it’s the score that really sells this character beat and makes the scene work overall. John Williams has crafted more classic film scores than almost anyone else, and whilst The Force motif used in this scene might not be as well known as the main Star Wars theme or The Imperial March, it’s still a highly memorable piece of music, and what’s more, it suits the scene perfectly. To be frank, it’s nothing short of freakish how well Williams has been able to imbue The Force theme with such a strong sense of impending destiny. Even more brilliantly, this sensation swells as Luke’s eyes peer towards the sunset and then subsides as he looks away, somehow evoking our young hero’s current inability to realise this destiny and the disappointment he feels as a result. It’s a testament to how richly layered Lucas’ Star Wars saga is that something as minor as a 30-odd second snippet from one of the films can generate over 1,000 words of analysis, but in the end, that’s what has allowed this legendary franchise to endure in the public consciousness for almost 40 years. That’s it for the first of The Pop Culture Studio’s Star Wars-themed series of posts. Let me know what you thought about it in the comments below or on Twitter or Facebook! Disney ruined Luke. The Luke of the EU is the true character. Not a hiding coward who gave up.